This will be my next project after I finish my A6M2b Zero. I kind of started this a couple of years ago but I ended up having to go in to the hospital for a liver transplant so it got shelved. So I'm going to try and finish it. I have the Brazin wheels/tires, Profimodeller brass gun barrels, G-factor landing gear and kits-world devil dog decals. I'm thinking about the Eduard or Yahoo's instrument panel. Any suggestions on other stuff will be greatly appreciated. 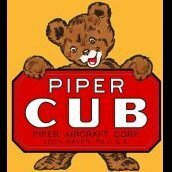 this is the plane I'm going to do.are the decals. These are the decals. Going to have to get an extra bottle of glossy dark sea blue. I've got a pair of these under construction at the moment. They're in the HK group build section. You may want to consider the Eduard corrected seats as well. HGW also has them in a set with their fabric seat belts if you want add those as well. Last thing would be nose weights. There's a couple sets out there or you can make your own. I used pennies in one of mine as they're no longer legal tender here in Canada. Thanks Bir I'll check them out. I’ve been picking away at a PBJ-1H for well over a year now. So it’s nice to see another Marine bird. I made the mistake of deciding to use almost every single piece of PE known to man, so I power out often and the project stalls again. I’ll be following this and hopefully I’ll get my mojo back too. This will be awhile in the making still collecting stuff for the build and I need to finish the Zero. I will be lurking in the background with interest Ron. Great choice. I'm pretty sure Am is classified as a disease these days. This is cool! I didn't know the Marines flew anything bigger than Corsairs during WWII. Yupp, they flew Dauntlesses too. 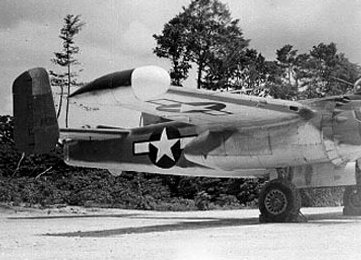 Anybody have any pictures of the wing radar that they used on the PBJ-1J's? I've looked all over the net and can't find any information or pictures of this setup. I'm thinking about using the radar dome from a Trumpeter F6F-3/5. Like this. I'm not sure if this will work or not since I can't seem to find any pictures of how the radar was on the PBJ-1J's. Also if anyone has these parts left over from their build I'll buy them, I could sure use em. I finally found pictures of the radar setup. read a post on Britmodeler that said you could make it out of a bomb nose and P-38 drop tank. Time to do some scratch building. I believe that the Profimodeler PBJ set may have the radar dome in it. Ernie has the set so should be able to confirm if it doesn't doesn't. 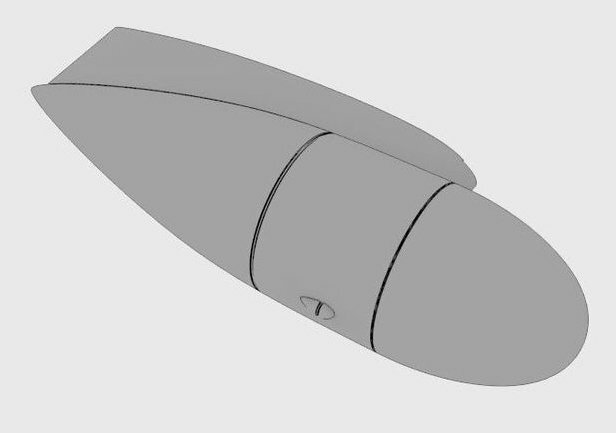 It's definitely included in the Profimodeller set #32202. Length is 68mm and the diameter is 19,7mm. Thanks, I went to there site and that doesn't look like the picture I posted. It's too long, it hangs off the rear of the wing. The one I show, bottom picture, is for a 1/72 scale PBJ-1J. You can see that it ends at the rear edge of the wing like the upper picture. I did need the dimensions thanks. The mentioned set is for a PBJ-1H and not a J. Maybe that's the reason for the difference. There's a pic in Ernies post which shape ways looks like the one from the PM-set. That picture in Ernies post is a G or H not a J.
I've been doing a lot of investigating on the net and I have found out that almost all of the Marine PBJ-1Js didn't show up to very late at the end of the war in 1945. 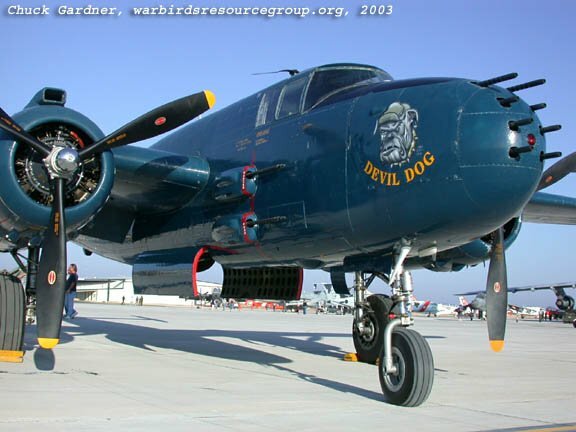 The decals I have for "Devil Dog" are for a tribute bird to the Marines. It's not a plane that served in the war so not sure how correct it is. I don't want to make a post war commemorative bird. I want to do one that actually saw combat. My main problem is I can't seem to find any pictures of the 8 gun nose strafer version of the PBJ-1J used by the Marines. 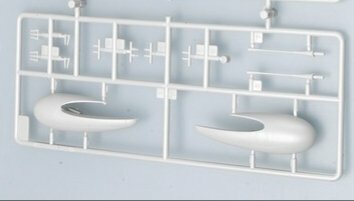 All of the VMB squadrons pictures that I have found seem to either use the glass nose or the G/H version with the cannon. If anyone on here has pictures of a Marine PBJ-1J with the 8 gun strafer nose and or any books that give information on them please let me know. I have the Squadron book on the B-25 but it mostly covers the G/H version. Ron, I don't know if the Marines used the gun nose J or not. 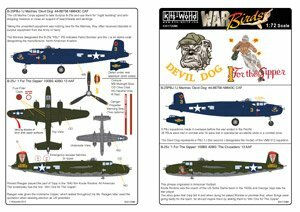 Kitsworld does a number of decal sheets that are warbirds or movie ones. They don't always label them clearly though. As for if the Marines had gun nose J's, this book might be able to shed some light on it. Maybe Ernie can chime in with what info he has. Thanks Blr I'll check into it. I just checked my copy of Schiffer's "B-25 Mitchell: the Ultimate Look". It lists that the Marines did have the J but not whether they had a glass or gun nose unfortunately.